Planning for my 2012 race calendar started last November when I was approached by Matt from No Meat Athlete. See I’ve been a No Meat Athlete reader for a few years now, and have been in contact with Matt several times for various reasons. At some point he found out that I worked on events, and mentioned that NMA was thinking about launching a few events of their own. I told him to e-mail me if he ever needed any help, and that e-mail came early November. No Meat Athlete was planning their first ever official group training and race event around the first ever Rock n Roll DC Marathon/Half Marathon. I was thrilled to offer up my services, and be apart of the group, so suddenly an earlier than expected marathon was going to kick off my year of running. The Training: It is hard to say if it was climate change or the running gods that gave me and everyone else in the region a near ideal winter for training, but for whatever reason, I am thankful (no, I don’t actually appreciate climate change, but as I fight to slow it, I might as well enjoy it, right?). Training for the Rock n Roll USA marathon ended up about as uneventful as possible. I ran hard, created my own schedule, and stuck to near daily runs and once a week long runs. For the first half of training I logged mostly trail miles, even venturing out of the city several times for longer runs in Virginia. During the second half I pounded the pavement, trying to work a bit more on speed and getting my knees in shape for long hours on the road. Once the course was finally released, I went out on several runs along the route, getting to know the hills and turns. Overall I felt pretty good through training and kept healthy. About all a runner can ask for this early in the season. The Weekend: The weekend started off right, with a short 2 mile jog. Originally this run was open to the entire training group, but when no one showed up in the hotel lobby except for Matt, I think it was a bit of a blessing. The 20 minutes spent chatting with Matt allowed us both to clear our heads and relax a bit before a big weekend. After a quick shower I met KFB and a few others from the group to walk over to dinner. There we gathered as a group nearly 40 large at Cafe Green for some delicious vegan pre-race dinners. While chowing down we swapped race goals and plans, shared favorite veggie/vegan eateries, and laughed over good stories. Matt and Susan spoke on behalf of No Meat Athlete, and a special guest Gene Baur from Farm Sanctuary, who was also running the marathon, got us all fired up on the importance of our lifestyles. 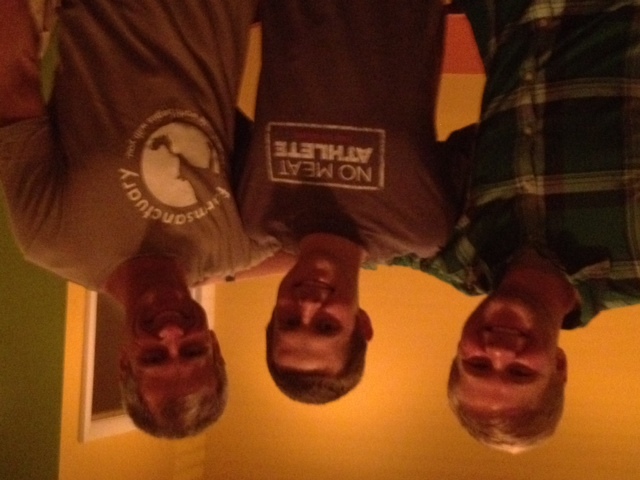 It was truly a great night with the No Meat Athlete community. The Race: Race morning came early, with the alarm sounding at 5:45 am. I met up with Matt, his wife Erin, and another runner to carpool to the start. Surprisingly, the trip was quick and easy, and we joined thousands of other runners around the start area to pass some time. After a few group photos, a last minute pit stop and a little stretching, I lined up in my corral to wait for the gun. They released each corral about 2 minutes apart, which ended up making for a fantastic way to spread out the 20,000+ runners. After it was our turn to go, I took off ready to flight my way to another marathon PR, even looking forward to the next several hours. I started off really strong. I knocked out 5, 10, and 15k splits a good 20 seconds per mile faster than I planned. This always happens, and I always end up regretting it, but in the moment, I thought maybe this time I’d keep it together the whole distance. The course for the first 13.1 I knew very well. I had run nearly all of it in training, much of it multiple times. This time though, it was lined with supporters at every major intersection, and as silly as it sounds, the Rock n Roll bands really were something to look forward to. I was having a ball. Climbing up Connecticut Avenue and through Adams Morgan, runners were welcomed by people pouring mimosas in between cheers on their front porches. Somewhere around 16th Street, I ran into KFB, who I greeted with a sweaty kiss and she sent me on my way. It was nice to see the city out, celebrating the run, the community, and a reason for morning beers (it was St. Patty’s Day, after all). Then came the split. The dreaded split I knew would have an effect, but something I hoped to just ignore. At about mile 12.5, the marathoners took a right, and the half marathoners sprinted to their finish. It was with that right turn that a very noticeable change happened around me. I look over to the runner next to me and say ‘whoa…’. His response, ‘yeah…’. I later learn that the race had over 16,000 half marathon finishers and only around 3,100 marathon finishers. 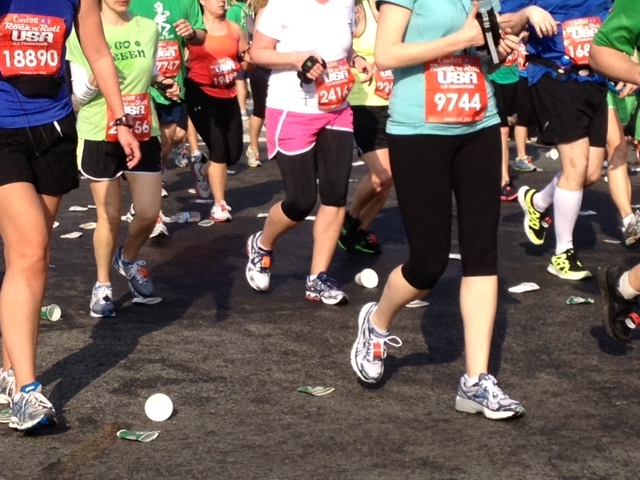 That high energy and great vibes flowing like the green beer continued straight, as I went right. It became most apparent when we would pass by those same street corners as before, only this time they were empty. The good news was that I was still feeling good. I slowed a bit on miles 14-17, but was still knocking out faster splits than the original plan. Things really didn’t start to turn until we crossed over the water and hit Anacostia. For the next several miles we ran alongside the river. It is actually really beautiful down there, with a nice waterside park and bike trail. Unfortunately it was also straight into the wind, really quiet, and wide open to the warm sun. The miles really started taking their toll, and I began to slow. And slow. And slow a little more. Suddenly I was 4 miles from the finish and running like I had no goal time at all. What was different this time around, was that I knew to expect it, and knew that I could push through it. So I did, even though it hurt. I did slow down, falling well below my target pace, but my head was in the right place and my legs kept turning over. It was through this time that I was forced to reflect on why I was running, and why I wanted to keep running. More than once I asked myself if this was really worth it. Thankfully the answer was always yes (otherwise I might still be walking around Anacostia somewhere). And more than once I asked myself if I really wanted to run nearly twice as far in a few months (TNF 50). For some reason, that answer was an even easier yes. A good journey isn’t always easy and isn’t only fun. A good journey has a purpose, and leads you somewhere unfamiliar. This journey had plenty of highs, but also it’s fair share of lows. The highs are easy to remember, but the lows are when you learn not only about why, but what. What you are capable of, and what makes you tick. The feeling of lows during a race is not unfamiliar, but every time I’m left to discover a new and unfamiliar way back up, and a new and unfamiliar reason to get there. I heard a joke few times leading up to the race that went a little something like this, “At least in Anacostia fear will keep you running fast!” To which I responded with a “ha, ha, I’m sure it will be a great place to run.” But the truth was, I had no idea, I had spent virtually no time outside of a car in Anacostia. But as I ran the (not so bad) unfamiliar streets, I was also in search that unfamiliar reason to keep going. Thankfully, I found both my way back towards RFK and the will to keep moving. The Finish: Overall it was a great race and a great day. While I fell too far off pace those last few miles to hit my goal time, I still PRed, which is fine by me. I was met at the finish by a slew of other No Meat Athlete finishers, where we shared stories, tried desperately to find shade, and started the recovery process. The hard work was rewarded soon after with beers and bluegrass. A huge thank you goes to Matt from NMA for coordinating the event and asking me to be a part of it. And big contrats to all the NMA runners, as well as friends Kristin, Greg, and Allison for all completing their first half marathons! Another special thanks to everyone in all four DC quadrants who came out to support runners, and to KFB who patiently waited for me to run by, and humored me through a sweaty kiss! I look forward to the next journey.